The gloves are made of Hypora waterproof and breathable outer membrane. The inner side of the gloves is reinforced with additional gussets made of leather in order to ensure the best quality grip. Whereas the whole is insulated with the Thinsulate fabric patented by the 3M concern. 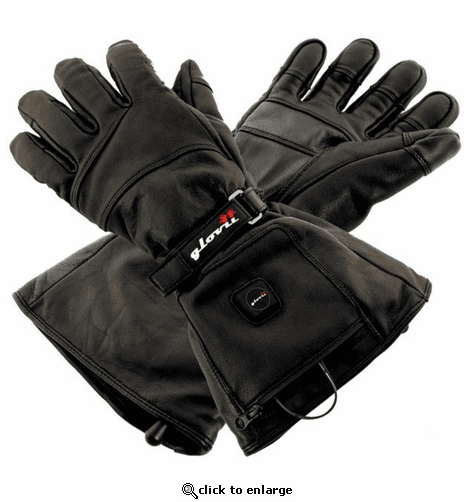 The energy needed to heat the gloves is provided by two durable batteries. Their capacity allows for maximum 8 hours of work. The heating element is placed on the outside of the hand, at the place most exposed to cooling. The control of the heating is carried out through the panel placed on the top of the glove. The adjustment range of the heating allows for obtaining 25%, 50%, 75% or 100%. The thumb and the index finger of the glove are finished with special fabric allowing for operating touch screens. So you will not have to take your gloves off in order to answer a call, to check the weather or to take a photo on a slope. Battery charging is carried out with use of a dedicated network battery charger and lasts about 6 hours. Therefore, after an entire day of fun on snow, you will regenerate your accumulators at night in order to use the additional warmth on the next day.